San Marcos Mayor Jim Desmond, a Republican running for the county Board of Supervisors, is brushing off any political harm from remarks he made to a GOP group in November. Jim Desmond speaks to GOP audience in November 2017. Photo via Kimberly Mead. Several audience members are heard voicing their approval. In a phone interview Monday, Desmond confirmed the remarks but didn’t recall what led up to them. Desmond, a 26-year San Marcos resident, said English isn’t the city’s official language — just one that is used predominantly. He cited the city magazine and agendas as examples. He said local firefighters and sheriff’s deputies get extra pay if they speak another language. 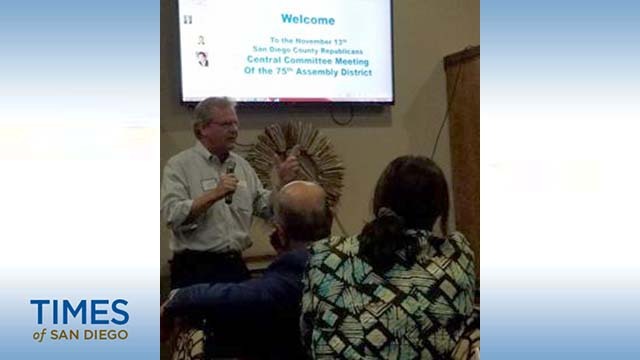 A photo of Desmond at the meeting — the 75th Assembly District GOP caucus at Mike’s BBQ in Escondido — was shared by attendee Kimberly Mead on Facebook. She confirmed that she took the picture. Also running to fill the North County seat of termed out Supervisor Bill Horn are Democrats Michelle Gomez and Jacqueline Arsivaud Benjamin. They didn’t immediately respond to a request for comment. The top two vote-getters in the officially nonpartisan June 5 primary will face off Nov. 6 if they fall short of 50 percent. The 2010 census indicates San Marcos is 37 percent Hispanic, compared with less than a third for the county as a whole. 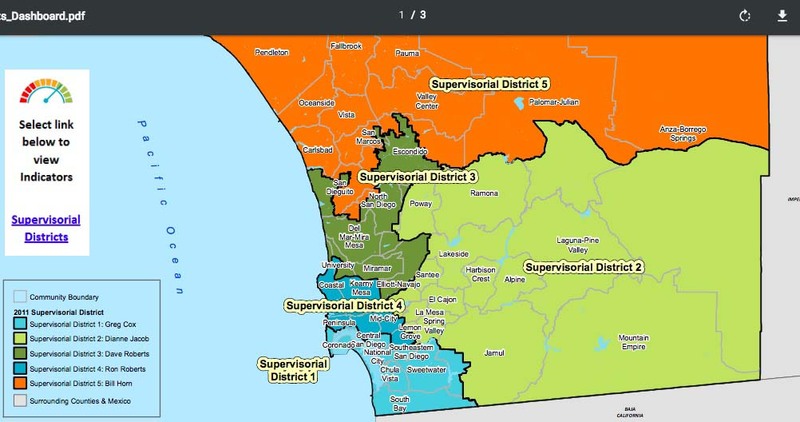 San Diego County’s District 5 also includes the cities of Vista and Carlsbad and stretches east to Anza Borrego Springs. As of April 2, the district had 325,831 voters — 37 percent Republican, 30 percent Democratic and 26 percent declining to state.